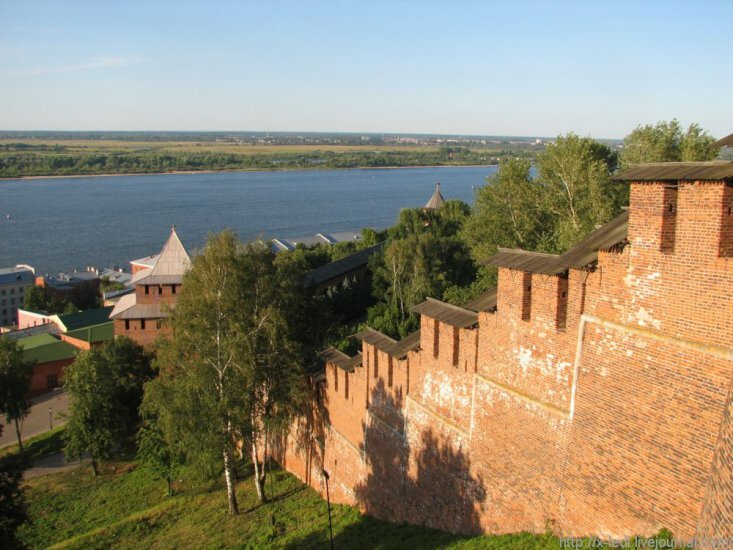 Like any good Kremlin, Nizhny's red brick edifice overlooking the winding Volga would once have struck fear into the hearts of the baddies du jour. Even today, as it appears around the river bend to travellers arriving by boat, it is an impressive structure. Unlike Moscow's famous Kremlin it's no fortress and the public can wander at will through its territories. 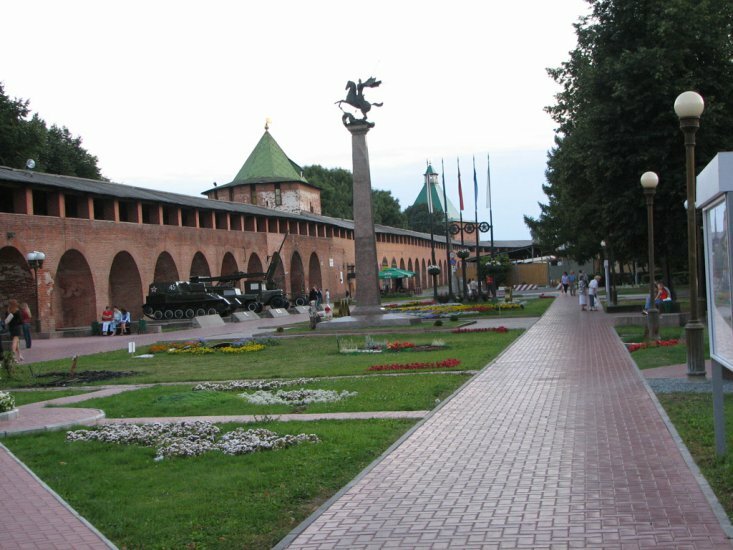 It currently houses municipal government centres, two galleries, a church and a war memorial, as well as small museums in some of the towers. 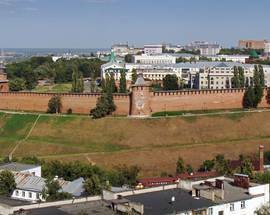 But once, when cities were built on a different scale, it encircled the whole of Nizhny Novgorod and (on the whole) kept them safe from the scary world of medieval Russia. The original structure was made from wood, but the ill-advised combination of open fires and a wooden city came to a somewhat inevitable conclusion when it burnt down in 1513. It was then sensibly decided to make a stone version which when it was completed looked much as it does today. And that means: a two kilometre wall, four metres thick, thirteen towers and chock full of artillery points - not something you want to get on the wrong side of. The wrong side, in fact, was the Khanate of Kazan, nowadays just the next city along the Volga, back then locked in a bloody and prolonged argument with Moscow. Nizhny's convenient position halfway between the two meant that it became Moscow's 'watch-city', a title that came with no small risk. It suffered its fair share of attacks and sieges over the years, but proved pretty much invincible. This could be thanks to the Kremlin, or it could be thanks to its fearsome inhabitants, as legend has it. 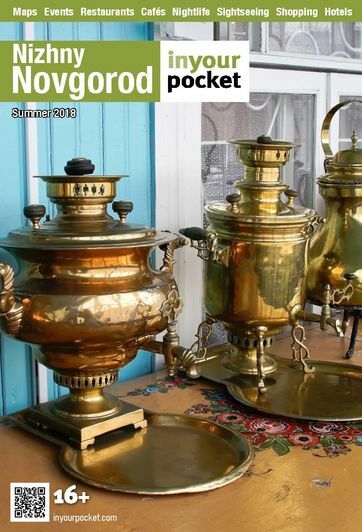 One story tells of a group of invading Tatars who, whilst working out the best way to get past those bothersome walls, came across a Nizhny woman with a yoke fetching water. She hardly looked like a threat - but this turned out to be a fatal mistake as she promptly attacked them armed only with the yoke in what one can only imagine to be an impressive display of karate-style skills. She succeeded in killing ten of them before she herself was killed, but those remaining were so shaken they went straight home. If this was what Nizhny's women were like, they reasoned, they didn't fancy meeting the men. 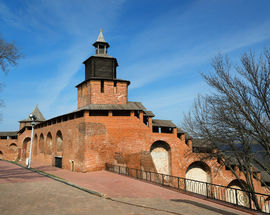 This is one version of events which explains the name of the tower at its south-western corner, Koromyslova Bashnya - 'Yoke Tower'. Another tower, Taynitskaya Bashnya, housed a 'secret route' to the nearby stream (though the tower's name - roughly 'Secret Tower' - seems a bit of a giveaway). 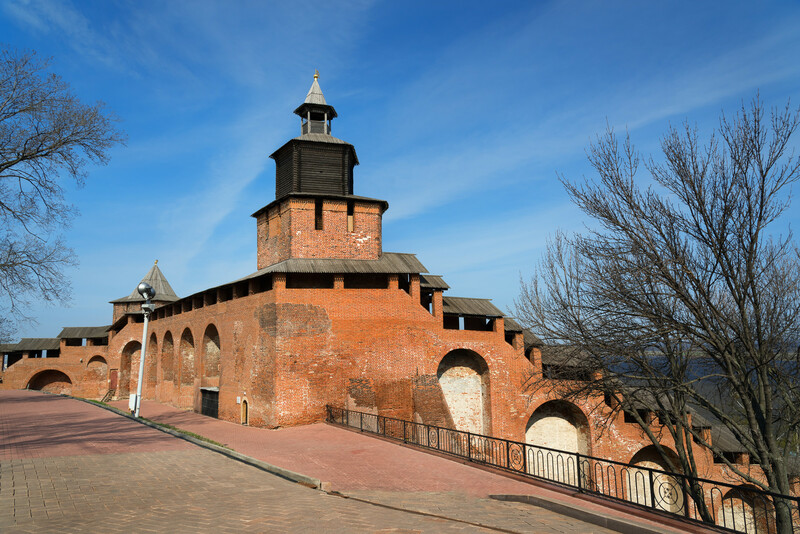 With the fall of Kazan, the Nizhny Novgorod Kremlin lost its strategic importance and fell gradually into disrepair. In fact, not until 1949 did anyone really bother to start repairing it, by which point it was looking pretty sorry for itself. The authorities over the centuries had scavenged parts of it for their own purposes and during the war rooves were removed to make way for machine-gun posts on the towers. A number of facelifts over the present decade have helped return it to something like its former glory. 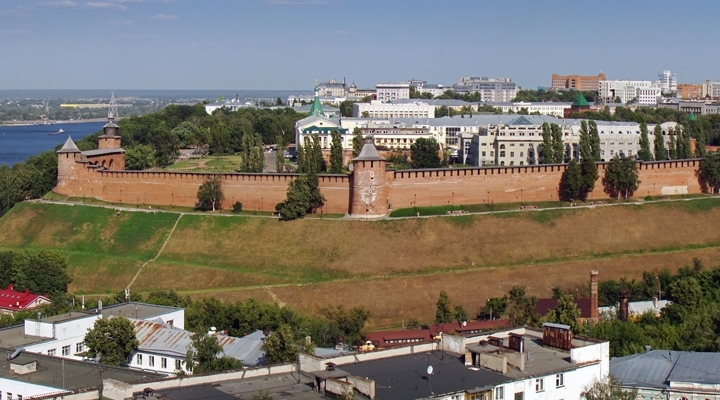 Nowadays you can stroll around on its grass, or take a walk inside its towering walls and enjoy the view.